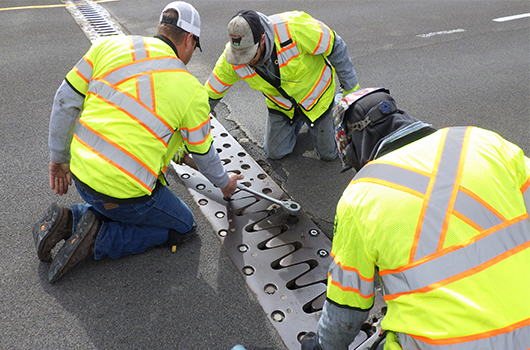 Earlier last week, crews in District 4 worked with the Headquarters Bridge section to repair damaged bridge joints on Interstate 84 near Glenns Ferry. It was most likely damaged due to the lower position of that joint compared to the rest of bridge deck and the resulting impact and vibration of passing vehicles. You can hear it on this video. During a routine inspection, HQ Bridge Inspector Toby Griffin found that a portion of the bridge joint was missing, and another section was broken and loose. Toby texted a photo of the damage to his supervisor, Dan Gorley, who quickly reached out to D4 Maintenance Coordinator Shawn Webb. After discussing the situation, it was determined that a lane closure would ensure the safety of motorists driving westbound on the interstate. Despite it being after normal working hours, crews were onsite and implementing traffic control within the hour, while district and headquarter personnel worked into the evening to develop an emergency repair plan. The following morning, crews were dispatched to the bridge deck to begin work. Repairs included removal of broken bolts, rethreading of damaged base plates, and welding and re-installment of the broken finger joint section. The Bliss Foreman area crew, the D4 Bridge crew, the D4 Welder/Machinist, and personnel from HQ’s Bridge Inspection crew all participated in repair efforts of the broken bridge joint.